Burundi is a landlocked country in the Great Lakes region of Eastern Africa bordered by Rwanda to the north, Tanzania to the east and south, and the Democratic Republic of the Congo to the west. Its size is just under 28,000 km² with an estimated population of over 10,000,000. Its capital is Bujumbura. Although the country is landlocked, much of the southwestern border is adjacent to Lake Tanganyika. Burundi (pronounced [buˈɾundi]), officially the Republic of Burundi (Kirundi: Republika y'u Burundi; French: République du Burundi), is a landlocked country in the Great Lakes region of Eastern Africa bordered by Rwanda to the north, Tanzania to the east and south, and the Democratic Republic of the Congo to the west. Its size is just under 28,000 km² with an estimated population of over 10,000,000. Its capital is Bujumbura. Although the country is landlocked, much of the southwestern border is adjacent to Lake Tanganyika. The Twa, Tutsi, and Hutu peoples have occupied Burundi since the country's formation five centuries ago. 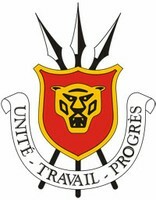 Burundi was ruled as a kingdom by the Tutsi for over two hundred years. However, at the beginning of the twentieth century, Germany and Belgium occupied the region, and Burundi and Rwanda became a European colony known as Ruanda-Urundi. Political unrest occurred throughout the region because of social differences between the Tutsi and Hutu, provoking civil war in Burundi throughout the middle twentieth century. Presently, Burundi is governed as a presidential representative democratic republic. Burundi is one of the ten poorest countries in the world. It has one of the lowest per capita GDP of any nation in the world. Burundi has a low gross domestic product largely due to civil wars, corruption, poor access to education, and the effects of HIV/AIDS. Burundi is densely populated, with substantial emigration. Cobalt and copper are among Burundi's natural resources. Some of Burundi's main exports include coffee and sugar. 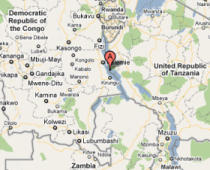 One of the smallest countries in Africa, Burundi is landlocked and has an equatorial climate. Burundi is a part of the Albertine Rift, the western extension of the Great Rift Valley. The country lies on a rolling plateau in the center of Africa. The average elevation of the central plateau is 5,600 feet (1,707 m), with lower elevations at the borders. The highest peak, Mount Heha at 8,810 feet (2,685 m), lies to the southeast of the capital, Bujumbura. The source of the Nile River is in Burundi province, and is linked from Lake Victoria to its headwaters via the Ruvyironza River] Lake Victoria is also an important water source, which serves as a fork to the Kagera River. Another major lake is Lake Tanganyika, located in much of Burundi's southwestern corner. PRODAP is one of the components of the Lake Tanganyika Regional Integrated Development and Management Programme (LTRIDMP), which includes priority interventions identified in the Strategic Action Programme and the Framework Fisheries Management Plan for the lake. The LTRIDMP is based on the needs expressed by the riparian communities and is consistent with the objectives of the Poverty Reduction Strategy Papers of the four riparian countries. Supporting partners for the LTRIDMP include the African Development Bank, the United Nations Development Programme, the Global Environment Facility, the Nordic Development Fund, FAO, the World Conservation Union and the United Nations Environment Programme. The capital of Burundi, Bujumbura, is the largest city on the shore of Lake Tanganyika, with over 400,000 inhabitants and an urban population growth rate of 6.4%. People in the capital are Dependent on the lake for domestic and industrial use, inputs to their livelihoods, and transport (Burundi is a land-locked country). Although Burundi has the smallest catchment of Lake Tanganyika, it has a significant impact on aquatic ecosystem functioning. Bujumbura city is growing rapidly, and present sanitary services are unable to process the urban population’s sewage in a proficient and ecologically appropriate manner. Pollution inflows resulting from untreated wastewater are affecting the northern basin of Lake Tanganyika. Pollution is a serious health hazard to people. It also impacts aquatic biodiversity and fisheries productivity by changing water parameters and affecting the quality of lacustrine habitats. The UNDP/GEF Project on Lake Tanganyika aims to improve the wastewater treatment system of Bujumbura city, support the development of discharge standards, and increase local capacity to implement and monitor a modern wastewater management system. The Burundi Component of the UNDP/GEF Project on Lake Tanganyika focuses on improvement of the wastewater treatment system in Bujumbura, using the Buyenzi suburb as a demonstration site. Construction works to improve the sewage system are a priority, as this area has very shallow ground water and contributes significantly to pollution of the lake. The Project Management Unit (PMU) includes staff from the National Institute for Environment and Nature Conservation (INECN) and the Municipal Technical Services (SETEMU). The PMU works together with the Ministry for Land Management, Environment and Tourism and the Ministry for Internal Affairs, as well as with the private sector, which provides co-financing by completing pre-treatment facilities. The project also supports the development of discharge standards, and the PMU takes active part in water sector discussions lead by GIZ. Furthermore, the project aims to increase capacity to implement and monitor a modern wastewater management system. In partnership with UNEP/Nanjing Institute of Geography and Limnology, water quality monitoring facilities are being improved and staff has been trained.